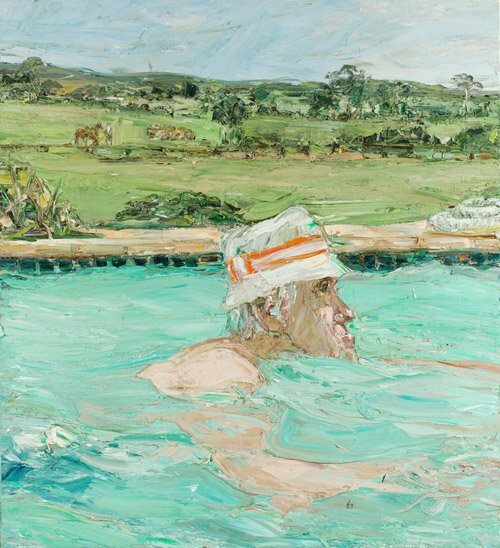 Nicholas Harding has been an Archibald finalist every year since 1994. He won the Archibald Prize in 2001 with a painting of actor John Bell and was highly commended in 1998 for his portrait of artist Margaret Olley. In 2003 he painted Margaret Whitlam and in 2002 and 2004 submitted portraits of Aboriginal artist Rusty Peters, the second one more informal and colloquial than the first. Harding’s subject this year is painter Robert Dickerson who, with his distinctive angular style, is one of Australia’s most recognised figurative artists. After agreeing to sit for Harding for an Archibald portrait, Dickerson and his wife Jenny invited Harding, his wife Lynne and son Sam to their holiday house in Culburra on the South coast for a weekend. Born in London in 1956, Harding came to Australia in 1965. He completed a Bachelor of Arts in 1975, travelled through Europe then returned to Australia to a career as an animator, illustrator and painter. He has had regular solo exhibitions at Rex Irwin Gallery in Sydney since 1992 and a solo exhibition in London in 1997. He has been represented in numerous group shows including the Dobell Drawing Prize, which he won in 2001, the Wynne and the Sulman Prizes, the Doug Moran National Portrait Prize and the Kedumba Drawing Prize. His work is held in a number of Australian collections including the Art Gallery of New South Wales.